CRM Dashboards or Sales Gamification…What’s Better? This is the first edition of “What’s Better?” Each post in the series will bring questions and proposals I hear from the field directly to you! I will highlight a specific objection or proposal I hear on the idea of sales gamification and then explain the best approach. Let me start by saying these are two distinctly different approaches that should be used in conjunction. I get this all of the time: “Can’t I manage sales competitions via my dashboards?” The answer is sort of, but how motivating do you really think that is? Dashboards are great for showing sales activity, but they are static and tend to show the same metric every single month – pipeline, dials, opportunities created, closed deals, etc. This is all great information, but how impactful is the act of seeing it to your bottom line? As a sales person, I look at these static dashboards daily. I’m in a stacked ranking in part of it, but still, what I see on my dashboard isn’t really on my radar once I actually start my day. With inbound calls, meetings, travel, emails and whatever else I happen to be doing, my dashboard gets lost in the shuffle until I look at it when I have 5 minutes on a Monday morning. I’m not saying that dashboards aren’t important and have no place. They are great for offering some visibility into performance. But, they do not drive me as sales person to be better, because they do not hold my focus. They do not provide a REAL-TIME view of what’s important. So, how do we pivot into a strategy that actually works to keep people focused on what matters in the moment? 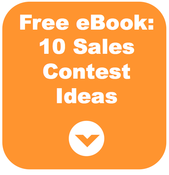 Enter sales gamification, or running contests around critical sales behaviors. The best and only truly effective way to implement sales gamification is to leverage all levels of sales leadership. Let sales operations run the long-term president’s club or more elaborate spiffs, but always make sure there is a more granular strategy coming from direct sales leaders, too. Your direct managers are the only ones who are truly connected to their unique team, which has its own challenges that are constantly evolving and changing. As a sales leader, I know that if my team makes 10 more dials each that should result in 5 more meetings as a team, which breaks down to 2 new opportunities in the pipeline. I also know that our close ratios go up dramatically if we are working with director-level or higher contacts within our opportunities. So, I want to make sure that my team is not only focused on making more dials in general, but doing so to the right people. To get my team back on track I am going to run a sales contest around making director-level or higher calls on current accounts. It will run for an hour each day this week at optimal dial times. After reading a study from InsideSales.com I know that the best times for dial blocks are between 8-9 a.m. and 4-5 p.m., so I will set my competitions to start at those times throughout the week. As the team stays focused and motivated on calling quality prospects, our pipeline begins to fill with quality opportunities. After the contest, I see how our pipeline’s grown right on my dashboard. I get the question all the time: Can't I just substitute sales gamification with CRM dashboards? Here's the answer.